In this project – an interior refurbishment of a former CBD office space, maximum effect was sort with a minimal budget. The relaxed program of living amongst translucent partitions within an open-planned living space reflects the contemporary urban lifestyle synonymous with it’s CBD location. 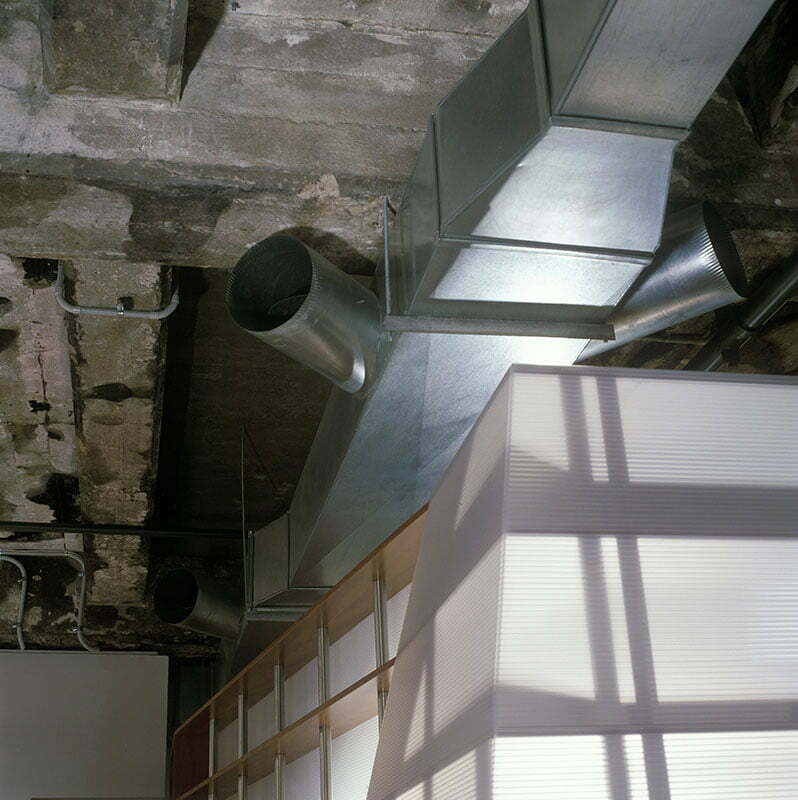 Physically, the space is defined by two architectural devices. The first is a freestanding multipurpose joinery unit which simultaneously fulfils the functions of bedroom partition, kitchen pantry, refrigerator housing, wardrobe and bookshelf. As a sculptural object, it floats free of existing services and adjacent material surfaces. The second, is an iconic floor motif sandblasted into the existing concrete floor screed. 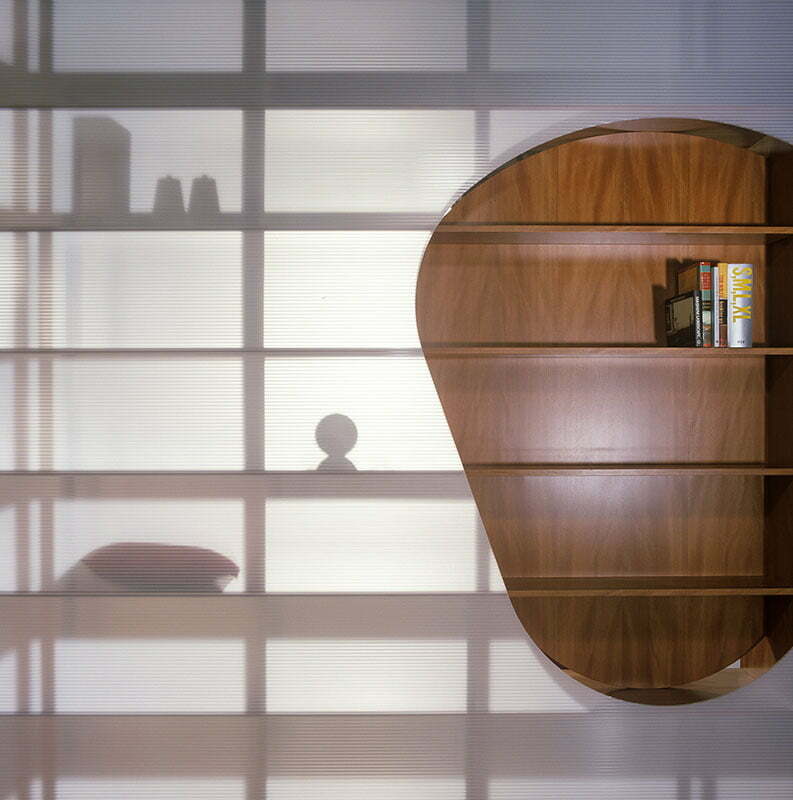 Constructed from precision-assembled twin-wall polycarbonate sheet, the freestanding unit becomes a focal point for the interior – almost operating as a glowing light source with the inadvertent effects of shadows cast by objects on shelves. The tapered cut-out motif references the floor treatment and arrests one’s attention upon entering the apartment. Minimal impact was made to the existing shell to achieve as much effect as possible with the budget. Floor and ceiling finishes mirror each other’s raw existing condition – in direct opposition to the newly painted wall surfaces. Existing air-ducted mechanical and fire-sprinkler services are retained as visual (and operative) features in the design. The kitchen area is deliberately modest (in accordance with the client brief), and to give way to the visual importance of the free standing unit. All storage is confined to open shelving, to eliminate the joinery cost of cupboards and drawers. Together with the free-standing unit, the kitchen provides an appropriate narrowing of the space at the private end of the apartment.